Breakfast can be arranged on request for 2Euros/person. 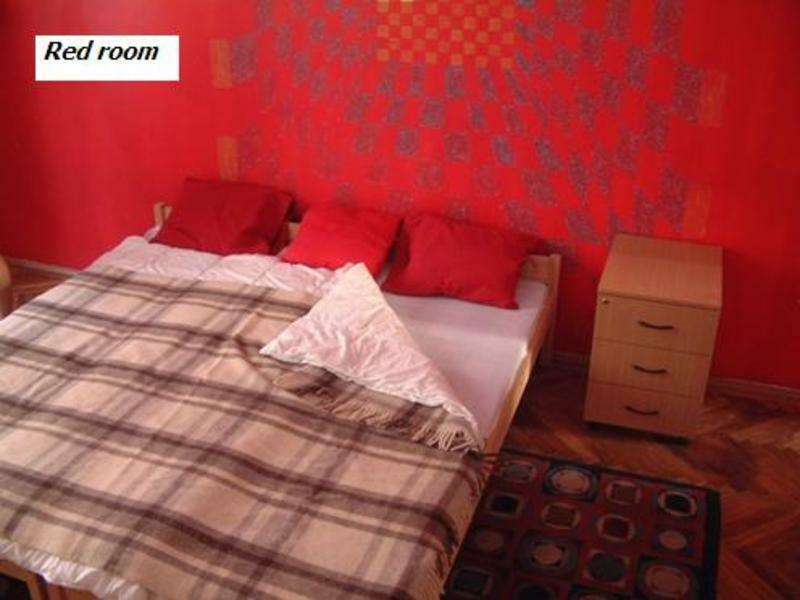 If you are fed up with the crowded, chaotic and noisy atmosphere of other hostels then you will enjoy Casa Nostra! We provide for our guest skype & free internet. You can make landline phonecalls any countries all over the world for free! As the name indicates, Casa Nostra is characterized by a captivating personal style that creates the feeling that you are in the flat of your best friend and not in a hostel. We have a 24-hour common area with cable TV and a kitchen. We are located in downtown Budapest, which is filled with many pubs, cafs and restaurants. You will find a lively musical scene and various other night life activities. Within 3-5 minutes of walk you will surely find a good dancing club (the name is INSIDE) or an alternative funplace, such as Kultiplex or Mony. Budapest's most famous open air concert place, such as A38 or 'Zld Pardon' -adored by young people- are also nearby. Central Market Hall, supermarket, pharmacy, Museum of Applied Arts are also just a few meters away from us. And if you wish to enjoy the most famous spas of Budapest, the Thermal Bath at Gellert Hotel and Rudas are also within walking distance, just across the Liberty Bridge. We take special pride in the attractive atmosphere of our hostel, which is creatively decorated to capture the feeling of buoyancy, excitement, adventure, and fun to coincide with your joyful mood when visiting our beautiful city. You are certain to enjoy our spacious rooms, as you relax and enjoy the company of others without the crowding that characterizes many other hostels. The bedrooms have 2 and 4 beds. We take care to provide a clean environment, hot water 24 hours a day, free internet, free use of bed linens and towels. Casa Nostra doesn't have any hidden charges!!! Our English, French and Italian speaking staff is eager to provide you with any information and help to organize your trip to Budapest. Casa Nostra is an anti-party, quiet place. Alcohol should be consumed only in moderation at the hostel. This might be disturbing if you want to consume these items at the place of your residence. We feel certain you will want to take advantage of the many lively bars in the area. At the same time it helps us to create a peaceful and calm atmosphere that makes us more suitable for rest and sleep. Please consider this before you make your choice! Check in: 16:00-23:00. If you have to arrive earlier or later than this time please contact us to arrange your arrival. Please note that our prices DO NOT INCLUDE the city tax which is 3euros/person/night. We are located at 31/J Ráday street in the 9th district. This is a 5 minute walk from 'Kalvin ter' (square) and the metro (blue line). Once at Kalvin ter just follow Raday Street until you see number 29 on a large restaurant (the name is CARAMIA)on the right corner (opposite a large pink tanning salon). Turn right at this restaurant and Casa Nostra Hostel will be on your right at the very first entrance, number 31/J. Doorbell 47. Second floor, left balcony.